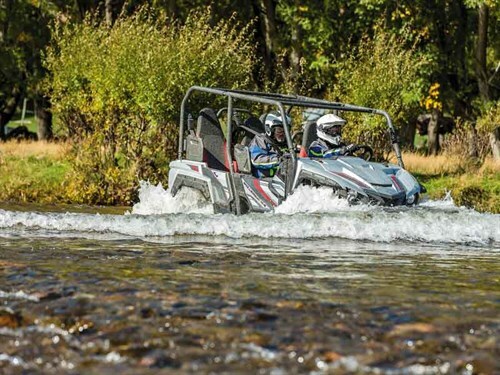 While Yamaha has long offered a two-seater side-by-side, the Wolverine X4 is essentially a brand-new four-seater ROV, and it’s clear that plenty of thought has gone into its design. The glorious autumn weather provided a stunning Queenstown setting to view the new Wolverine X4. With a bunch of hand-picked bike enthusiasts from around New Zealand and Australia keen to put it through its paces, we didn’t waste any time heading for the hills to see if the performance lived up to the promises. While Yamaha had an impressive line-up of UTVs and ATVs available, the Wolverine X4 really was the start of the show. 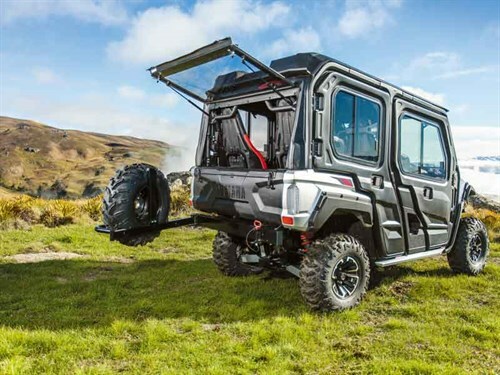 The ROV can be adapted from two to four seats, with the ability to move the second row of seats out of the way for extra deck space, making it hugely versatile for everything, from farming and hunting to tourism and pure adventuring. With the initial safety briefing over, for which the wet weather held off, conditions worsened just in time for us to ensure a thorough testing in less than ideal conditions. While the rain pelted down, those of us in the fully enclosed cab weren’t worried at all; we were just keen to tackle the tight, twisty narrow tracks, which showed off the manoeuvrability of these new side by sides. The speed sensitive power steering, which is standard, helps the operator keep greater control through rough terrain with minimal effort. With our ground contour varying from sandy and loam tracks through to the more challenging wet and slippery clay and rocks, the independent wishbone suspension front and rear did a good job of soaking up the bumps along the way. When not driving, the rear seats were not a bad option. Being bucket seats front and rear, there is no difference in this regard, and clever design has left enough legroom for even the larger guys; so it’s not just an extra seat for children along for the ride as is often the case. With four passengers on-board, there isn’t a lot of deck room for carting extra gear, but towing a trailer is always an option. With only two occupants, you can slide the seats forward for additional deck room. The belt anchor points tuck into a cavity in the deck, leaving a flat surface for whatever you have to carry, which is good design. Yamaha’s design engineers went for a whole new engine for the Wolverine X4 – an 847cc twin-cylinder, fuel-injected unit. Aside from sounding pretty damn cool, this offers power in spades from the very bottom of the rev range right the way through to the red line. With a full load of passengers, I never felt we were running out of power when climbing steep hills in slippery conditions, although a heavy trailer behind us may have slowed progress a little. Yamaha has taken everyday functions into consideration throughout the design process, giving plenty of thought to things such as engine noise, using rubber mounting for the engine along with a large air intake and exhaust system and insulation to further decrease noise so you can still talk to passengers easily while driving. The 35-litre fuel tank should be plenty for a full day’s use, although, fuel consumption varies depending on the terrain, load, and who is operating the machine. If you have staff with limited skills, or a farm policy which for safety reasons limits speed, the Wolverine X4 model comes standard with a speed limiting key located under the front bonnet. This allows you to limit speed to 40km/hr without restricting the power, which is sensible and fast enough for most farm situations. 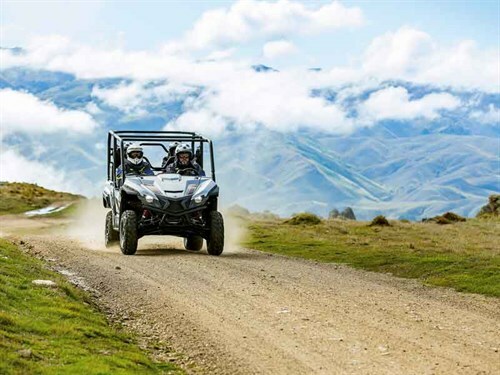 The transmission is one area where Yamaha has gone with its existing proven technology – the Ultramatic transmission, which is utilised across other UTV and ATV models of the Yamaha range. In this instance, the ‘if it ain’t broke, don’t fix it’ mentality is a winner. The Ultramatic has proven to be a reliable system. Thanks to constant belt drive, broken belts and the chance of breakdowns immobilising the machine are not something to be worried. The shifter on the Wolverine X4 is located between the two front seats, much like a car, with High/Low/Neutral/Reverse, and a pull handbrake also located in the middle, so it is unlikely to get bumped. For me, the key transmission feature is the engine braking, which happens automatically when you remove your foot from the accelerator. I think this makes it the safest system available in the CVT type drive systems used in side by sides. Safety is clearly a key consideration at Yamaha. With a steel rollover protection structure and a largely square design with an overall height just under two metres – if for some reason the machine does happen to go over – it is designed to not continue to roll. With the width of apex 1.5m, independent wishbone suspension with anti-sway bars keeping all four wheels in contact with the ground, and the engine mounted low in the frame, there were no questions for me around the issue of stability. All four seats are equipped with retractable belts. Doors have high plastic guards on the back half to prevent arms hanging out the side of the vehicle, and there are grab rails for all three passengers. Yamaha has opted away from the half-net door used by some other manufacturers, and to be honest, this usually just gets removed in farming situations. In terms of safety, just because it has a rollover protection structure does not mean that operators don’t require a helmet, along with the seat belt, gloves, eye protection, long sleeve shirt, trousers, and suitable footwear. Other features include incorporating ventilation in the top, a removable liner inside for cleaning, and ear pods that allow the wearer to hear what is happening around them. But my favourite one was the easy adjust buckle system ensuring the correct fit each time. 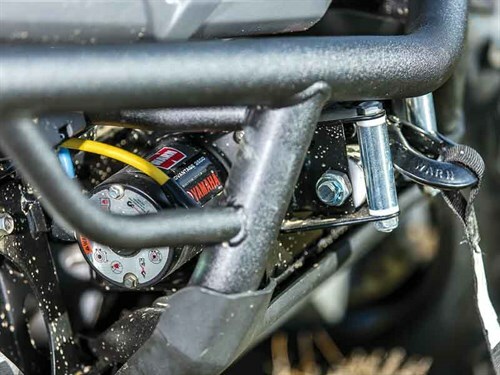 Another key feature of the Wolverine X4 is the speed management system. This works via a key system located under the bonnet to select normal, full speed, or power or speed restrictions. Yamaha has done a great job in terms of ride quality and handling. The best way to emphasise this is from the point of view of a backseat passenger – generally the most uncomfortable seat in the house. Considering you’re seated directly over the rear wheels, the independent double wishbone suspension set up with 226mm of travel soaks up the bumps of the rough terrain we experienced for our test drives. Another factor to appreciate is the comfortable, padded bucket seats used front and rear. 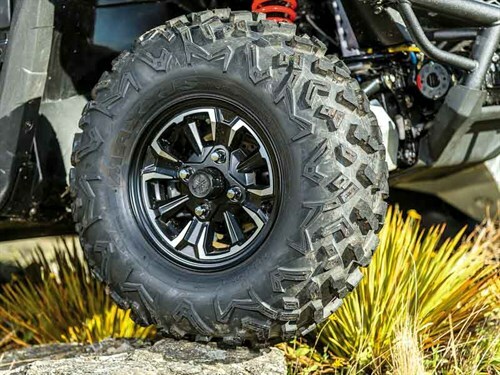 With four on-board, you would expect the rear suspension to be under constant load, and being independent suspension, decrease the ground clearance. The designers at Yamaha have found a way around this, which levels the suspension out, so it isn’t an issue. For rider comfort, different sized riders are catered for, with an easily adjusted driver seat position and tilt adjustable steering column. With more of an automotive style layout, key start transmission, and handbrake, the Wolverine X4 proved quick and easy to get familiar with in terms of operation. 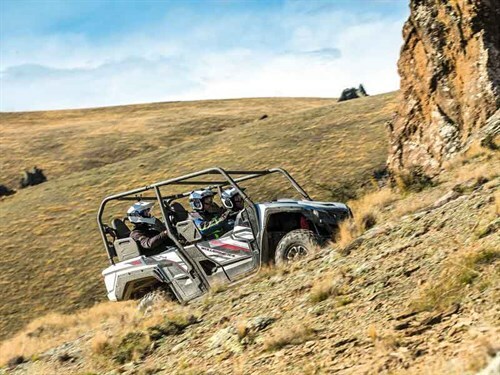 Adjustable driving position is key for operator comfort, while the 4WD system is simple to operate. A dial switch to the left of the dash allows three options: 2WD for flat dry paddocks or hard roadways and lanes, 4WD for pretty much all off-road work, and diff lock for maximum traction in tricky situations. The central LCD display unit shows features such as 4WD setting, driver seatbelt, and speed while buttons toggle through to display, hours, revs, and odometer. Once under way, the power steering gives smooth responsive control with excellent and stable manoeuvrability for a four-seater machine. The torque and power of the new 847cc petrol engine has plenty of boogie to get you wherever you’re going. One aspect I didn’t quite master was the accelerator control at low speed over extremely rough ground. The new drive by wire throttle is super responsive but just a little touchy in slow going. This is not noticeable with more speed and better driving conditions. LED lights are used front and rear for low draw on the battery. If you require extra lighting, built-in wiring makes hooking up extra spotlights or light bars straightforward. Yamaha has acknowledged that many people like to customise their work tools to suit their preferences and requirements. Mounting points for rooftops and cabs, etc., are built into the ROPS for easy fitting. 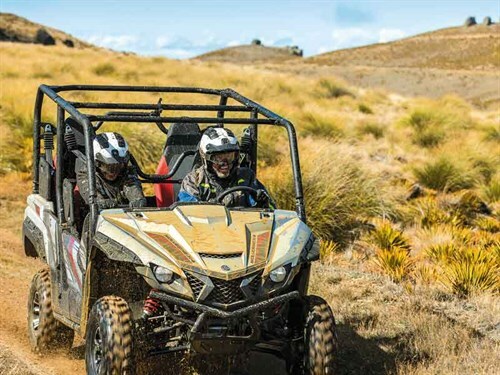 A range of factory accessories is available through a Yamaha dealer, with an impressive array of kit available for adding to the Wolverine X4. If you fancy all the creature comforts, you can even go for the full closed cab with heater and stereo. 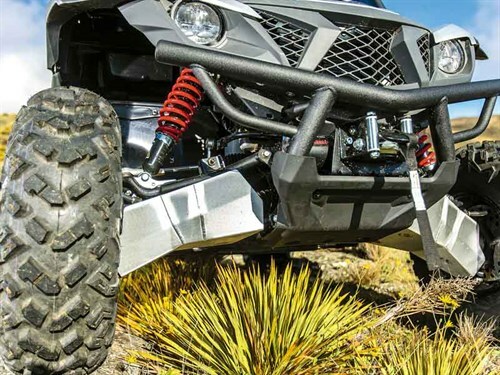 If you want to get right off the beaten track, the winch with extra alloy skid plate and A-Arm suspension guards may be more to your liking. For farming purposes, the hardtop roof and polycarbonate front windscreen would be options I’d consider for keeping rain and UV rays at bay. 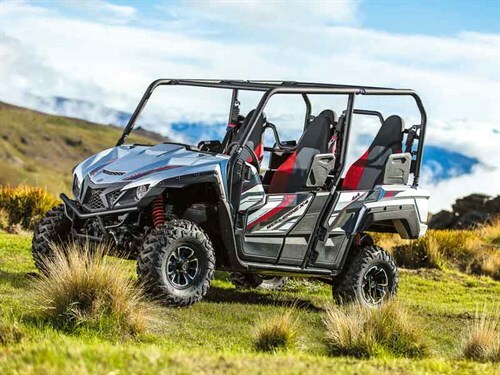 If you are looking to add electrical accessories such as LED light bars or a sprayer, Yamaha has wiring looms all ready to hook up, with space built into the dash for switches. As a completely new model to the Yamaha line-up, the Wolverine X4 brings some great versatility: it’s a solid workhorse, a family adventurer, and suits a broad range of users. With the change in regulations, the safety features offered as standard make it of interest to farmers and fits the ethos of applying the right machine for the job. With a three-year warranty, it ticks the boxes for investing in a quality machine built to last.